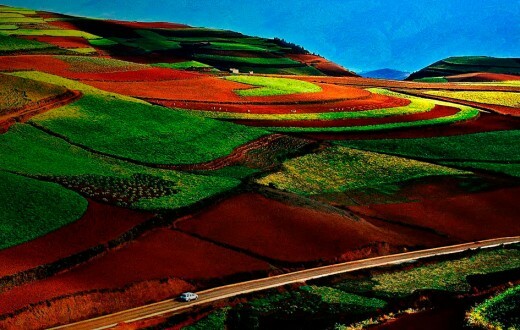 Wave-like red walls in Taizi Slope is called “Yellow River Wall with Nine Turns” . Wudang Mountain is said to be the place where the Zhenwu Grand Emperor prac­ticed Taoism and became an immortal, and is revered as the “No. 1 celestial moun­tain in the world with un­matched sceneries”. Over the past centuries, the mountain has been a tour­ist attraction shrouded in mystery as the origin of the world-renowned Tai Chi martial arts. After a five – hour drive on the express way from Wuhan, mountains began to be seen out of the windows, and the “golden top” of Wudang Mountain showed up in the distance. Located in Shiyan City, Hubei Province, Wudang Mountain is said to be the place where the Zhenwu Grand Emperor (the north god in Taoist myths) prac­ticed Taoism and became an immortal, and is revered as the “No. 1 celestial moun­tain in the world with un­matched sceneries”. Taoism, originated from the ancient times, is an indigenous Chinese religion which pro­motes harmony, and gains fame as one of the three ma­jor religions in China along with Confucianism and Buddhism. 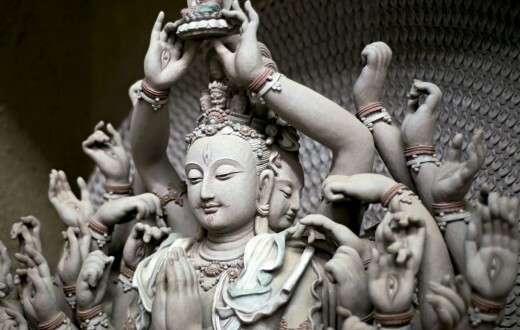 These religions have played a dominant role in the formation of tradi­tional Chinese culture. Because it is home to the imperial temple, the equivalent of Beijing’s Im­perial Palace in southern China, Wudang Mountain was conferred the title of “Grand Mountain”. Over the past centuries, the mountain has been a tour­ist attraction shrouded in mystery as the origin of the world-renowned Tai Chi martial arts. It was noontime when our car passed the gate to the mountain. Many res­taurants had already placed tables and seats outdoors, with sunshades stringing out close together along the road. Mountain chickens and bamboo shoots are among the specialty dishes of Wudang Mountain, and Tai Chi Soup, a kind of thick soup made with green vegetables and bean curd and turned into the pattern of “Yin Yang fish” through exceptional skills of the chef, proves the most favorite. Our journey to the celestial Taoist mountain started with the soup. Mountain chickens and bamboo shoots are among the specialty dishes of Wudang Mountain, and Tai Chi Soup, a kind of thick soup made with green vegetables and bean curd and turned into the pattern of “Yin Yang fish” through exceptional skills of the chef, proves the most favorite. Instead of taking tour shuttles and cable cars to the top, most tourists pre­ferred to climb slowly for an earnest appreciation of the famous mountain. 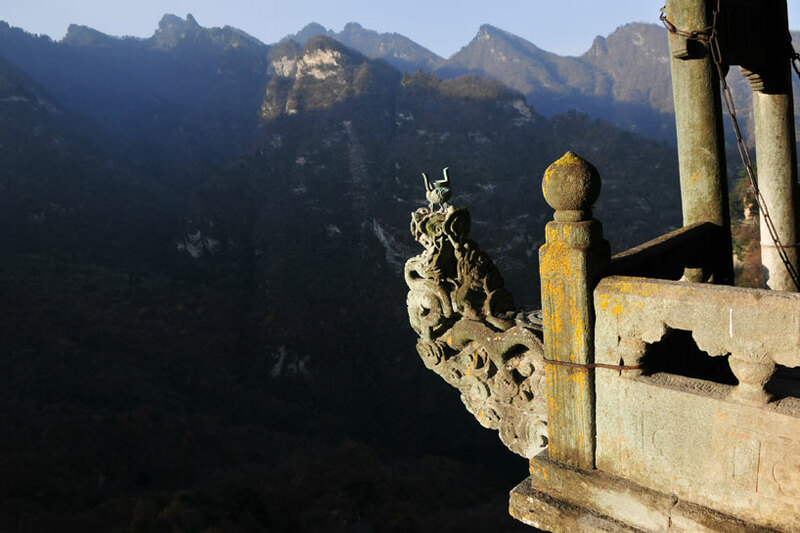 Local statistics show that in 2011, the scenic spot of Wudang Mountain received 3.546 million tourists. The stone stairs were highly crowded. Occasion­ally, we could see a Taoist wearing his hair in a bun and blue garment passing us gently but swiftly. For them, mountain climb­ing was just like walking on the street. Even before the tourists could see their faces, the Taoists had disap­peared into a Taoist temple featured by red walls and green tiles. Were they the Tai Chi masters in the leg­end, who sat in the clouds on the peaks and practiced Tai Chi in the wind? Their figures could be seen in the movies of Jackie Chan and their movements had at­tracted so many viewers! 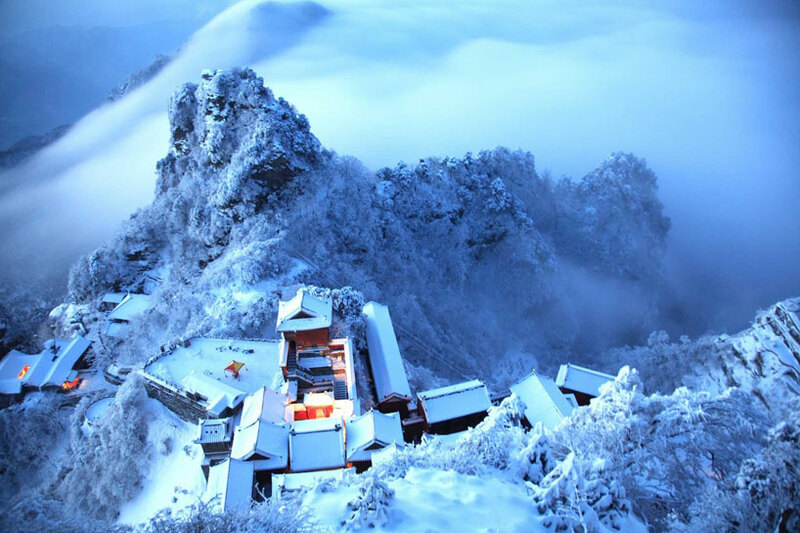 Wudang Mountain on a snowy day. 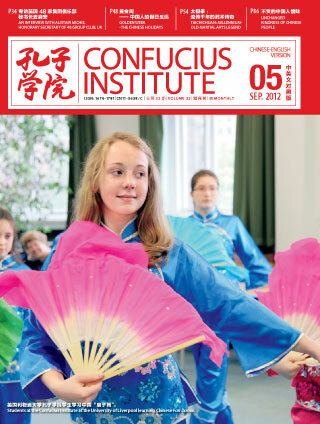 Zhang Sanfeng, a Tao­ist in Ming Dynasty, was respected as the originator of “the internal school of Tai Chi boxing”. It is said the mysterious Taoist lived for a few centuries, leaving many legendary stories behind him. 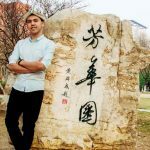 The internal school, featured by “beating the strong and dynamic opponent with soft and com­posed skills”, was invented by Zhang Sanfeng who got enlightened when observing a magpie combat­ing against a snake. Each day, many fans of Tai Chi boxing stand in front of the murals in Zixiao Palace and try to identify the scenes depicting the story. The open space in front of the palace is now the venue for the fans to practice Tai Chi. People from all over the world are seen here with the harmoni­ous air of Tai Chi flowing around them, just like the clouds floating in the valleys. Each day, many fans of Tai Chi boxing stand in front of the murals in Zixiao Palace and try to identify the scenes depicting the story. The open space in front of the palace is now the venue for the fans to practice Tai Chi. People from all over the world are seen here with the harmoni­ous air of Tai Chi flowing around them, just like the clouds floating in the valleys. Compared with Zixiao Palace, Taizi Slope is wrapped up in a bustling atmosphere. It is the place where the story about “grinding an iron pes­tle into a needle” was said to happen. Most of the tourists to this place are young students. Along the road leading to the scenic spot are dense sweet osmanthus trees with many red ribbons that repre­sent the prayers for blessings. The red ribbons and green leaves are matched perfectly. These ribbons are hung by the students asking for good luck in examinations. A narrow lane leading upward is lined by wave-like red walls with green tiles on the top, which looks like a flying dragon and is thus called “Yellow River Wall with Nine Turns”. Many shutterbugs were walking to and fro along the 71-meter lane with tripods on their back, trying to identify the best location to take photos. The dragon-headed stone with censer beyond the cli” of Southern Rock. If one speaks close to the wall, his voice can be transmitted to the other side. The smart structure of the wall is associated with that of the “Echo­ing Wall” in the Temple of Heaven in Beijing. 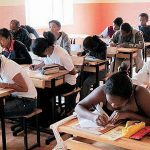 A few young people harbored some doubt about it. They cupped the hands close to the mouth and spoke in a low voice to the wall. Their words were accurately repeated by their partners in the distance. They laughed happily, arousing the interest of more tourists. An ordinary-looking five-level wooden building stands silently on the right of the wall, watching the tourists coming and going. This is the Wuyun (Five Clouds) Building well known among architects both at home and abroad for its unique structure consisting of one column and 12 beams. It was built very close to the mountain, with the roof supported by a single-timber column standing in the middle that is surrounded by 12 intersecting beams. Over 500 years has passed, and the building remains intact. In 1994, the ancient Wudang building cluster was included in the UNESCO’s World Heritage List. The most impressive are Ming Dynasty buildings that are said to be built because of a legend in 1412 when Ming Emperor Zhu Di decided to move the capital city to Beijing. When the Forbidden City was being built, the five-color auspicious clouds were seen on Wudang Mountain. 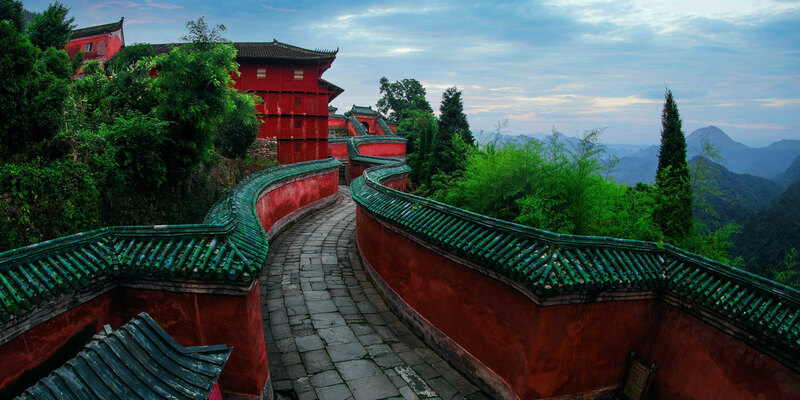 In the past centuries, many Taoist temples and palaces have been built on Wudang Mountain, forming a huge ancient building cluster featured by red walls and green tiles. Wuyun Building is simply one of the many. In 1994, the ancient Wudang building cluster was included in the UNESCO’s World Heritage List. The most impressive are Ming Dynasty buildings that are said to be built because of a legend in 1412 when Ming Emperor Zhu Di decided to move the capital city to Beijing. When the Forbidden City was being built, the five-color auspicious clouds were seen on Wudang Mountain. The Emperor who believed in Taoism was overjoyed at this phenomenon and began to pay attention to Wu­dang Mountain. Soon afterwards, he ordered to build the Imperial Palace in Beijing and build­ings on Wudang Mountain at the same time. The huge project involved more than 300,000 laborers and took 13 years to be completed. The buildings were built in strict conformity with the Emperor’s order that “the mountain itself should be kept intact” and the Taoist principle of promoting natural harmony. 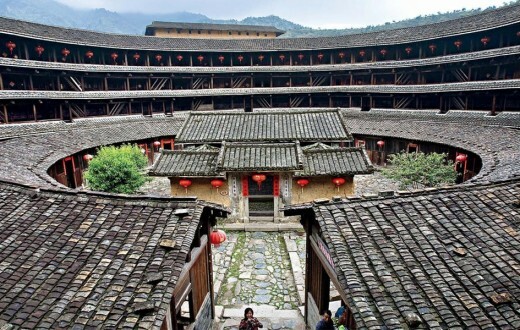 In this way, these buildings have co-existed with Wudang Moun­tain for 600 years. Taihe Palace standing on the highest peak of Wudang Mountain is the best place to appreciate the sunrise. Behind the Taihe Palace is Zijin City fenced by walls and called as “Forbidden City in the clouds”, where the Golden Palace is located. Some tourists would rather give up other scenic spots and climb to the peak at night just to watch the sunrise on the highest peak and make a pure pilgrimage. The sun rises on the east, revealing Wudang Mountains that extend 400 km. The peaks show up like flames oriented to the highest peak in the middle. All tourists gasp at the astounding scenes. 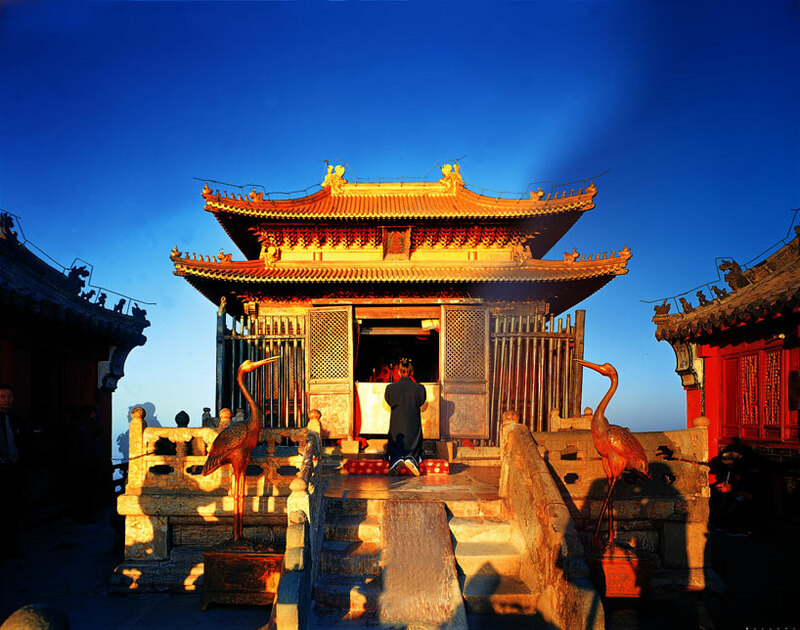 The Golden Palace on the peak, seeming to re­spond to the sunrise, emits the golden light into the air. The sky and land are in perfect harmony. And this is the most famous Wudang scene called “72 peaks paying respect to the Golden Palace”. People begin to kneel down to worship, or make snapshots to record the splendid scene. This wood-like gilded brass palace building weighs about 80 tons. All the components are seamlessly connected. Standing at the sea level of 1,612 meters for more than 600 years, it has experienced numerous chilly and scorching days without even the slightest slit or crack. Though the wind is blowing heavily outside the Golden Palace, the divine lamps area is burning without a moment of flickering. The sun rises on the east, revealing Wudang Mountains that extend 400 km. The peaks show up like flames oriented to the highest peak in the middle. All tourists gasp at the astounding scenes. Today, in spite of the well-paved stairs, firm fences and quality trekking poles, it is still difficult to climb to the highest peak of Wudang Mountain. But how did people transport the brass palace to the peak and what building techniques did they use? We can just make some rough estimation. The com­ponents were first made in Beijing, which were then transported along the Yangtze River and Hanjiang River before they reached the peak and got installed with mortises and tenons. Then the mercury and gold were melted into liquid and poured into the seams. The mercury would volatilize with heat, leaving the pure gold and brass components firmly welded together. The Golden Palace is protected by Zhenwu Grand Emperor represented by a huge tortoise with a snake on it. 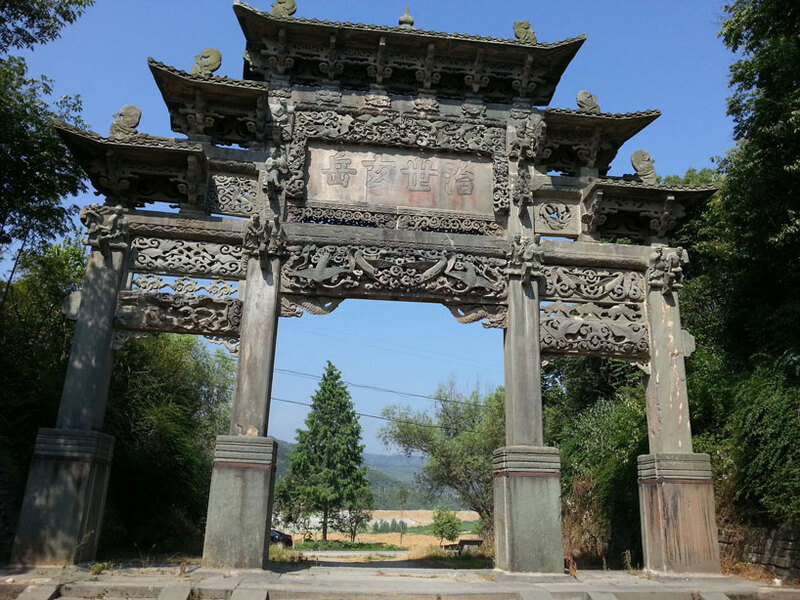 The tourists can find such de­sign almost everywhere on Wudang Mountain. It is said that the term Wudang means “only the Zhenwu Grand Emperor can make it”. The ancient Chinese people believed in the Zhenwu Grand Emperor firmly and even worshipped the Wudang in an extreme approach. 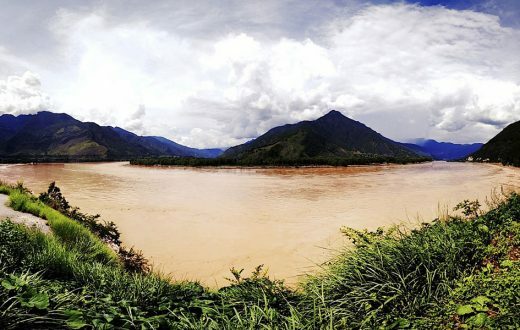 Opposite to the Golden Palace is a place called Southern Rock, which is another spot with fascinating sceneries. A dragon-headed stone carving juts out 2.9 meters long and less than 40 cm wide beyond the cliff. In the past, the pious people held incense in their hands and walked to the end of the stone carving without any safeguard­ing measures just to place the incense into the censer. No one knows result of standing on the end above the abyss to pray for good luck. Nowadays, the fences have been erected and people could only use a long pole to light the Dragon Head Incense. But the legends and miracles are still heard today. It is said that the term Wudang means “only the Zhenwu Grand Emperor can make it”. The ancient Chinese people believed in the Zhenwu Grand Emperor firmly and even worshipped the Wudang in an extreme approach. The mystery of Wudang Mountain is always full of charm. Today with advanced science and technology, there are still many mysterious things and phenomena on Wudang Mountain. An aerial photography happened to capture such a scene: the Tianzhu Peak (Heavenly Pillar Peak) in the mid­dle resembles the back of a tortoise surrounded by 345-meter-long Zijin City walls and the Shizi Peak (Lion Peak) on the north looks up into the sky, presenting a scene of tortoise and snake. Looking carefully, we can find the tortoise back has clouds that look like the Eight Diagrams. Is it just a co­incidence? Tourists can take the train from Wuhan and get off the train at the station of Wudang Mountain (Liuliping). If you drive your own car, you can take the Wuhan- Shiyan expressway for about 5 hours before reaching Wudang Mountain. 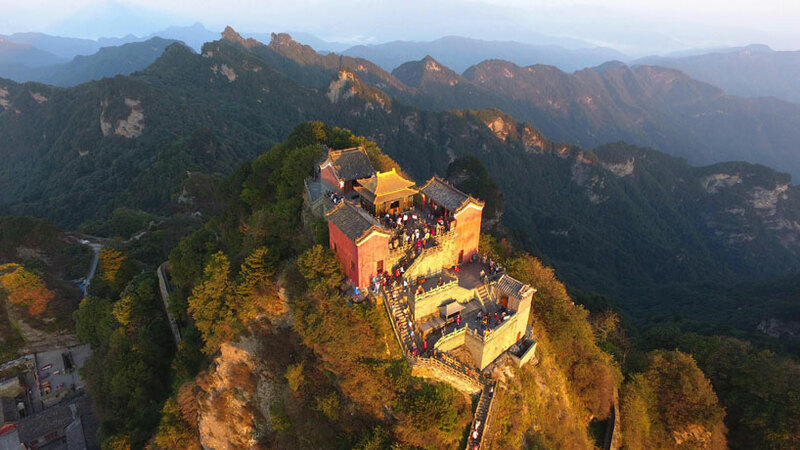 Ticket to Wudang Mountain is priced at 243 yuan per person, including the 140 yuan entrance ticket, 100 yuan sightseeing bus ticket and 3 yuan insurance. The ticket is valid for the day only. If you live on the mountain for the night, you don’t have to buy another ticket for the next day. Scenic spots that need to make extra payment are: Zixiao Palace (Purple Clouds Palace) at 15 yuan per person; Golden Palace peak at 20 yuan per person. The cableway measures 1,510 meters in length. The lower station is situated at the central Taoist temple on Qiong Platform, and the upper station lies between Xiuqiu Peak and Shizi Peak, 100 meters below the Golden Palace. It takes 25 minutes for a single ride.The cableway ticket is sold at different prices in different seasons. In the high season, the upward ticket is 90 yuan per person and downward ticket 80 yuan. In the off season, the upward ticket is 80 yuan per person and downward 70 yuan. The high season ranges from the first part of April to the middle part of November. Tourists can take the tour shuttle to the scenic spots wherever they like. 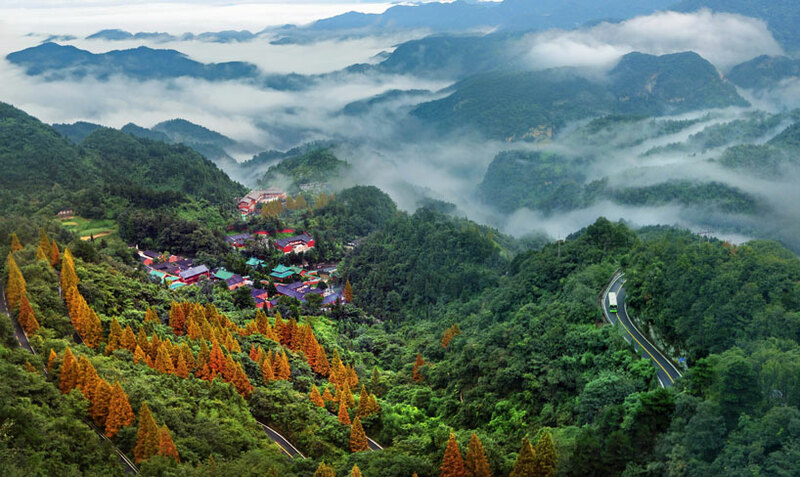 The terminal of the west route is Qiongtai scenic spot, where you can take the cableway to Taihe Palace directly and climb to the Golden Palace peak; the terminal of the east route is a scene spot called Wuya Ridge (Crow Ridge) and many hotels provide accommodation for tourists there. Tourists getting up at midnight often take this route and walk to the peak for the sunrise. In summer, you have to get up at 2 in the morning and climb upward at an even speed by starting with Wuya Ridge. 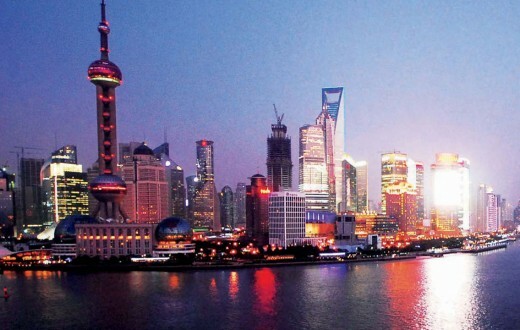 At 5 a.m., you will reach Taihe Palace with a broad vision to watch the sunrise. The road leading to the peak is divided into two paths at the Chaotian Palace. 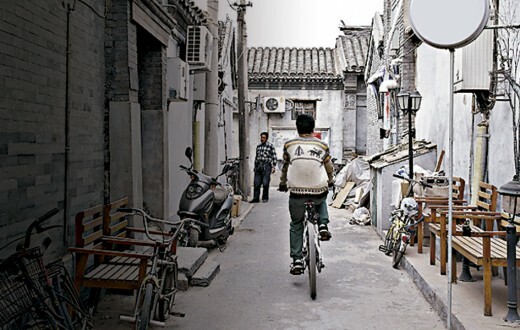 The “divine path” built in Qing Dynasty is longer, but it is easier to walk. The “divine path” built in Ming Dynasty has steeper stairs, which really challenge your strength. Flashlight is necessary. And take the path based on your physical strength. Because of the tranquility of the scenic spot Xiaoyao Valley, many people like practicing Tai Chi here. The movie Karate Kid starred by Jackie Chan and Jaden Smith, the son of Will Smith, had many shots at this place. Opposite to the Longquan Temple is a ground for martial arts exercise and there are two martial arts performances at 10:30 and 15:30 respectively with each performance lasting 20 minutes. Row 1 ticket is sold at 110 Yuan, row 2 at 90 Yuan and Row 3 and 4 are free of charge. You can also choose to stand and enjoy the performance for free. When entering the temple, please do not tread on the threshold. After getting in, please don’t point your fingers at the statues. Never ask the Taoists about their age or origin. Apart from the established roads for tourists, there are also some minor paths. Please stay away from these paths in case you lose your way.